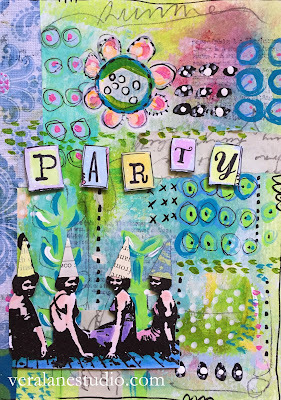 Kim is our hostess this week over at the Stampotique Designer's Challenge and is call for creations with an alpha letter made of Stampotique stamps. My "C" is for Christmas and filled with holiday inspired images. I traced a "C" stencil on sticky paper that was applied to white card stock. 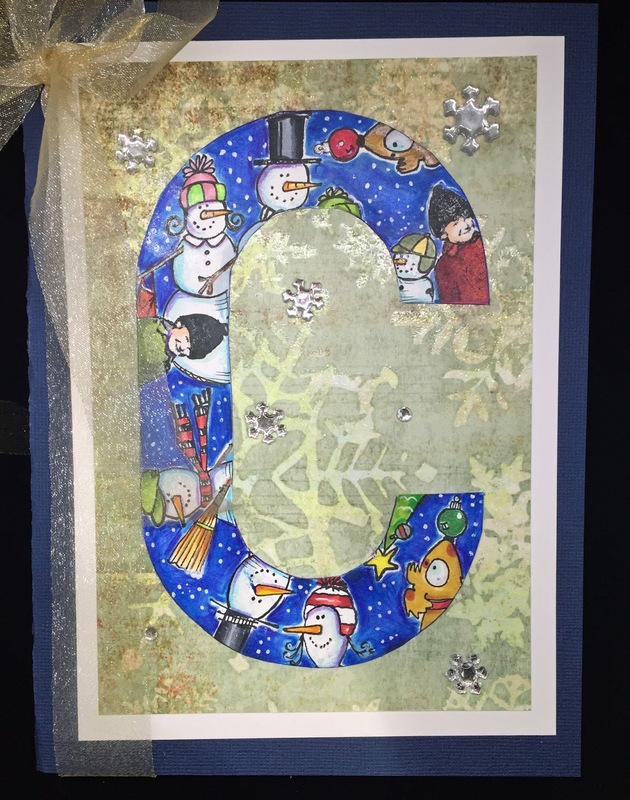 I used and x-acto knife to create a mask to protect the background and stamped images in the opening of the C. I left the mask on to color, creating harder edges for contrast. 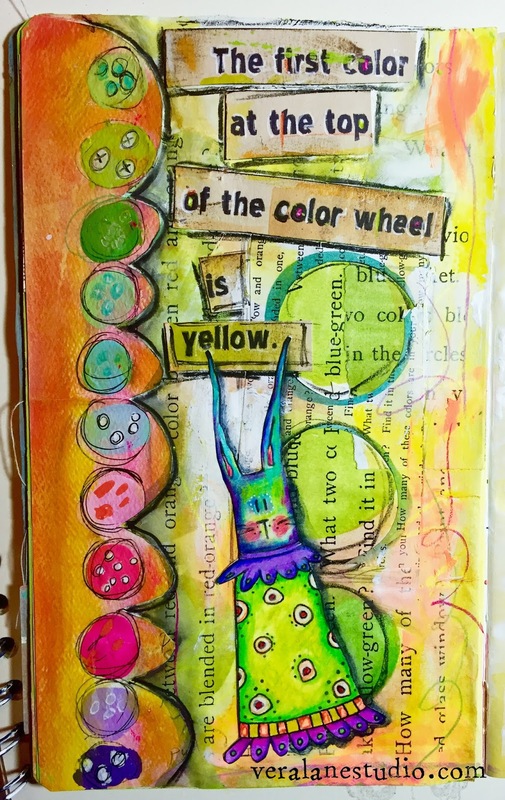 The images are colored with Copics and layers of Polychomos pencils. I thought the image seemed a little too stark on the white background so I trimmed the letter out and adhered it to scrapbook paper. Matted and framed on cardstock. 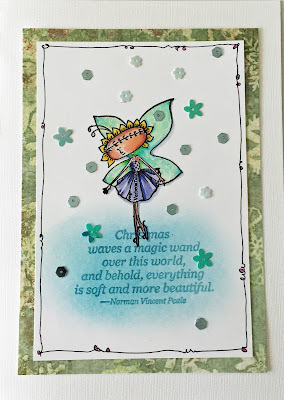 Faux gem snowflakes were added to creak up the background and add shimmer. Please join us in our last challenge of the year and a chance to win a voucher towards your favorite stamps. 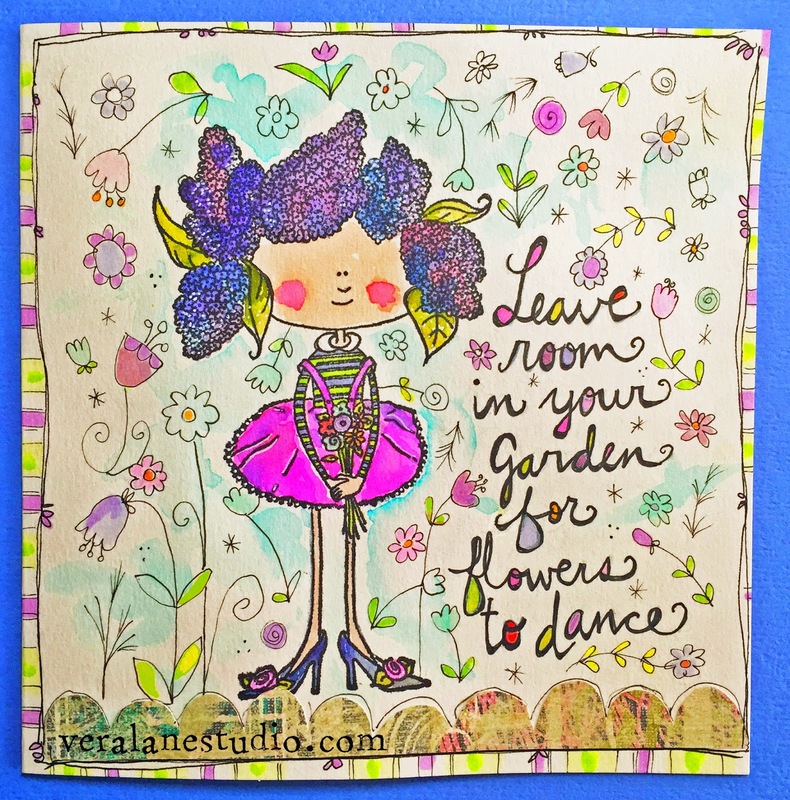 Valerie is hostess this week and she is requesting sequins for SDC 224! 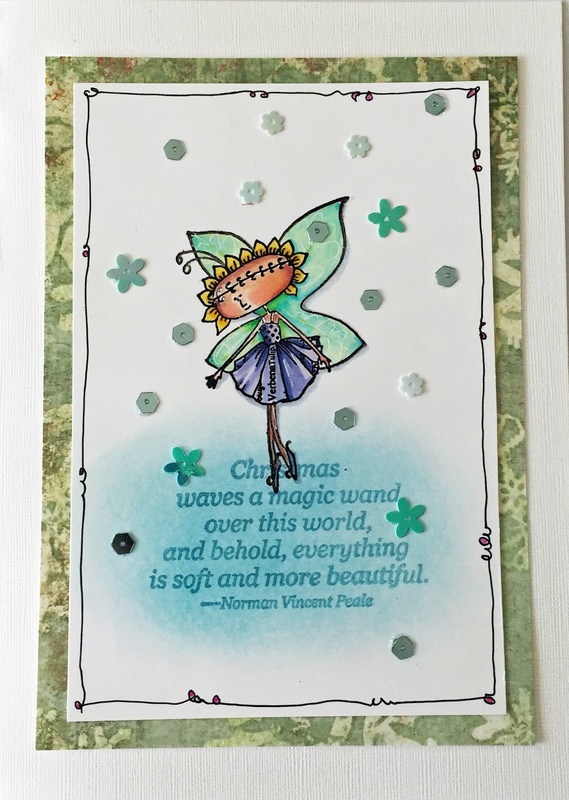 Verbena is floating on a soft cloud with Christmas quote stamped with Versamark then dusted with a few layers of metallic pebbles chalk. Sequins are set with diamond Stickles. 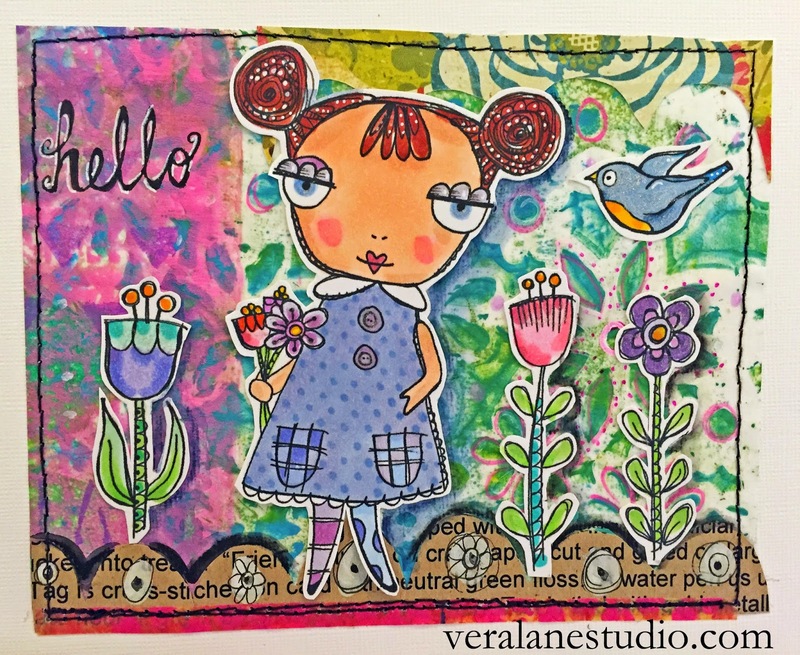 Verbena colored in Copic and Wink of Stella pens. 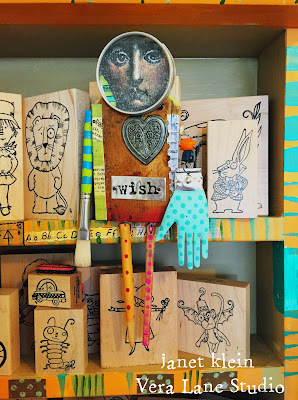 Please join is this week and a chance to win some of your wish list stamps! 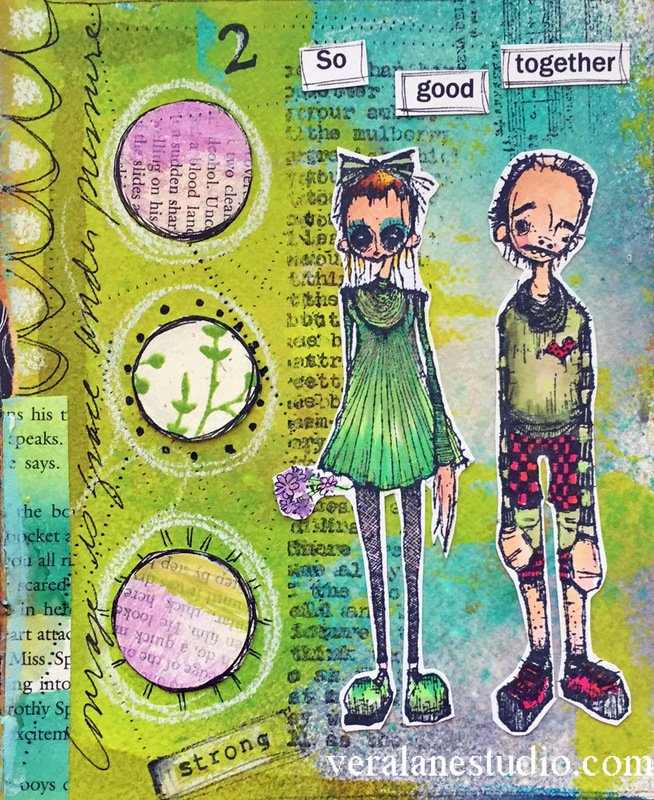 Gez is hostess this week for the SDC 218 Stampotique Designer's Challenge. She says her favorite color combination is blue and brown and she is asking for us to have fun with it! I always find myself needing a birthday card so I selected this brown paper that had "happy birthday" repeated in it -- snipped that out and set it aside. 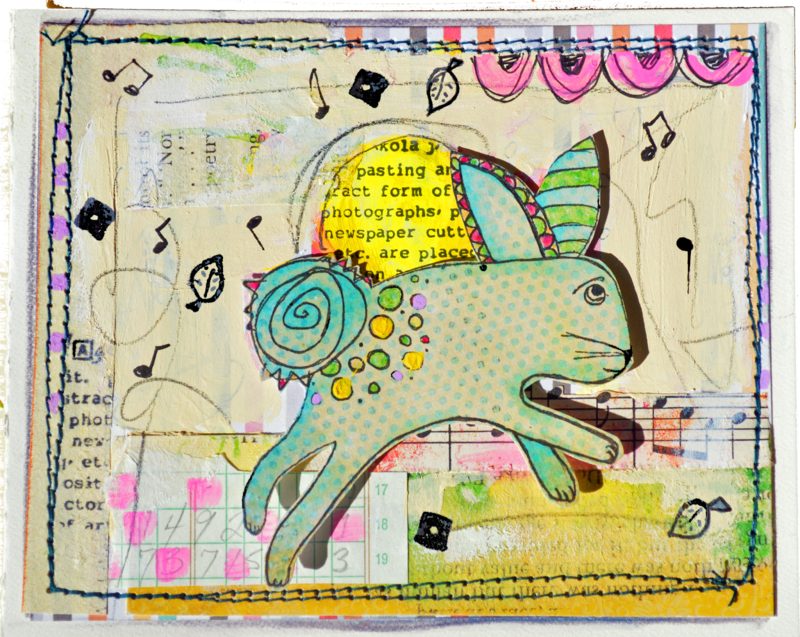 Then I went into my collage stash and found some blue tones and scraps to make an interesting background. 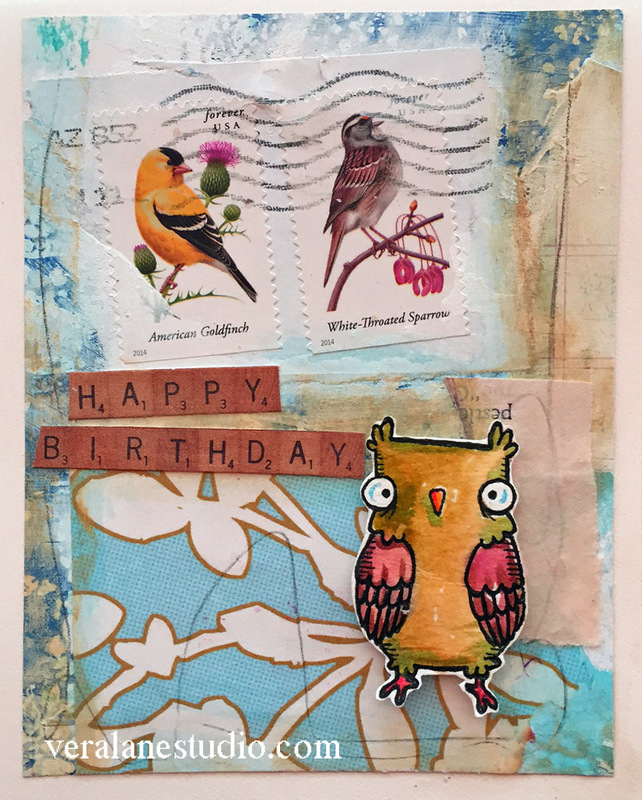 Kira Nichols little Owlseeyou image seemed the perfect stamped element to this background. I stamped him on watercolor paper and used a waterbrush and Peerless watercolors to color him. I know I have some other colors in this composition but this is my take on blue and brown! 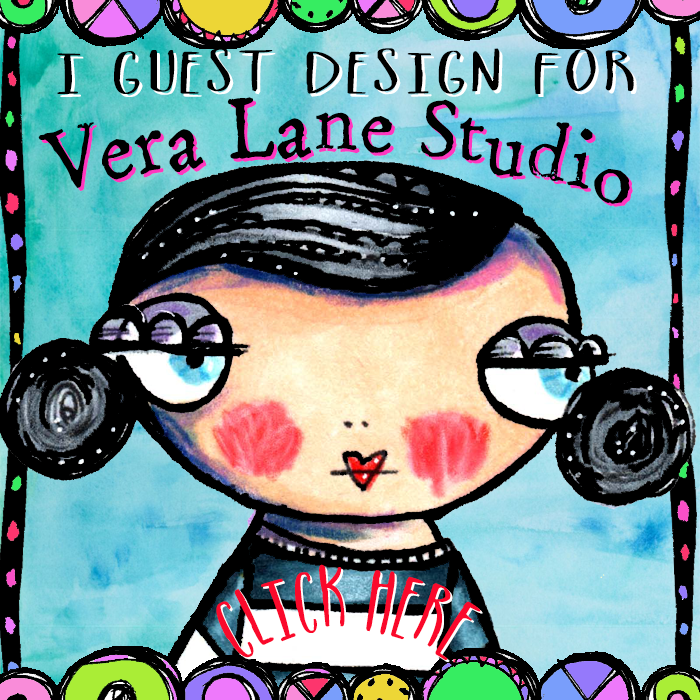 Vera Lane Studio's closed FB Group is having it's third ATC swap. 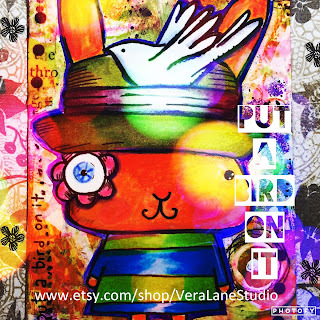 The theme for this swap is "Put a bird on it" using any Vera Lane Studio images. 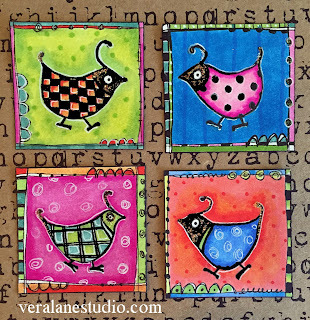 We have lots of birds in our sets so there are plenty of whimsical, quirky and fun combinations to explore! 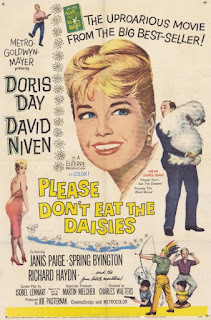 You'll even find a couple of free birds in our file section. You can join and register now. The actual swap calendar begins on October 30th, 2015. 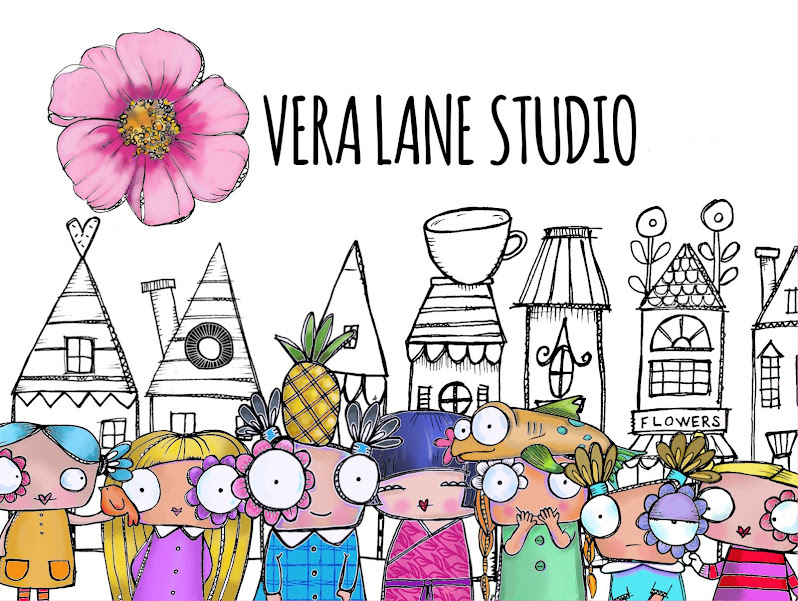 Visit our Etsy Shop and let your imagination run wild! Our sets integrate and there are unlimited possibilities to creating paper crafts with our versatile image sets. October is Breast Cancer Awareness month. October is also the month of my wedding anniversary. One of my dearest friends just began her chemo treatments prior to my wedding date. Her wish was to have her hair and be well enough to dance at our reception. 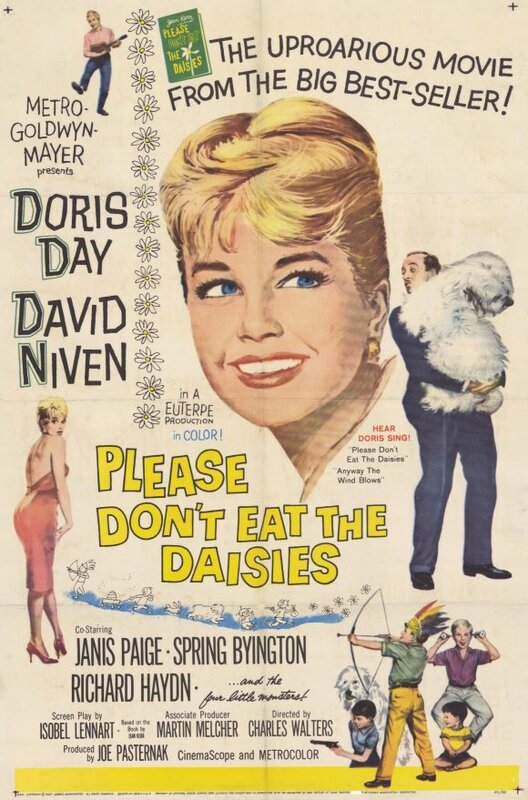 She did, and she did. 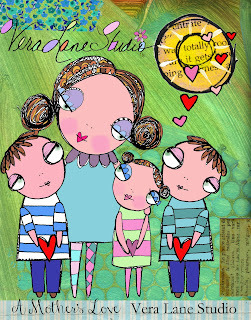 This digi stamp is to honor my dear friend for her courageous fight and all others who have come before and after her. I hope this confident gal named "PINK" will cheer someone who can use a pick me up or a little motivation. 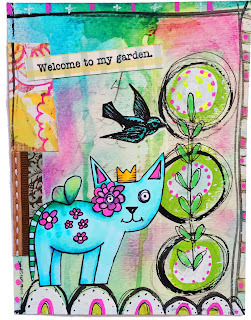 Coby is our hostess this week for the Stampotique Designers Challenge and is requesting that we all create a tag. 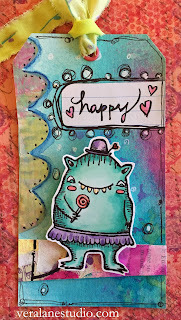 I love this chubby character named "Lollipop" created by Kira Nichols and thought it would make an adorable tag. 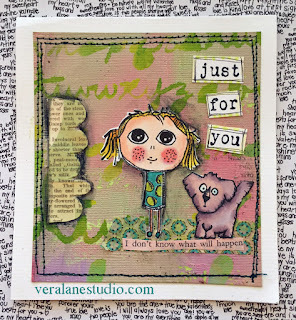 I stamped her with black Versamark and clear embossed then colored with Copic markers. The tag is made from Dylusions ® sprays and I added some scraps and doodles. 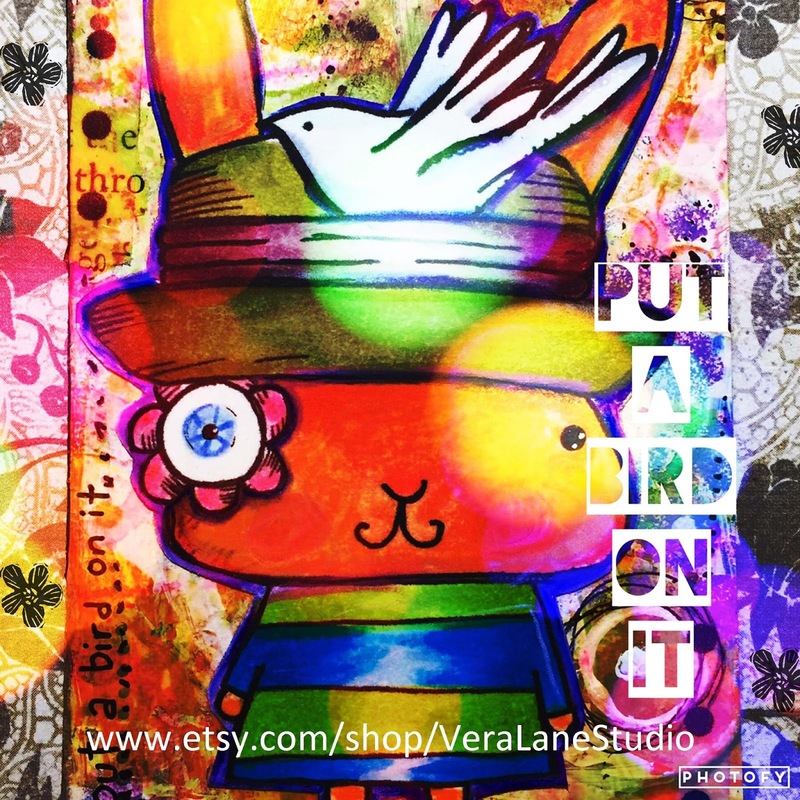 A fun and colorful tag to hand on a gift bag for most any happy occasions. So often we create to amuse ourselves or other adults. 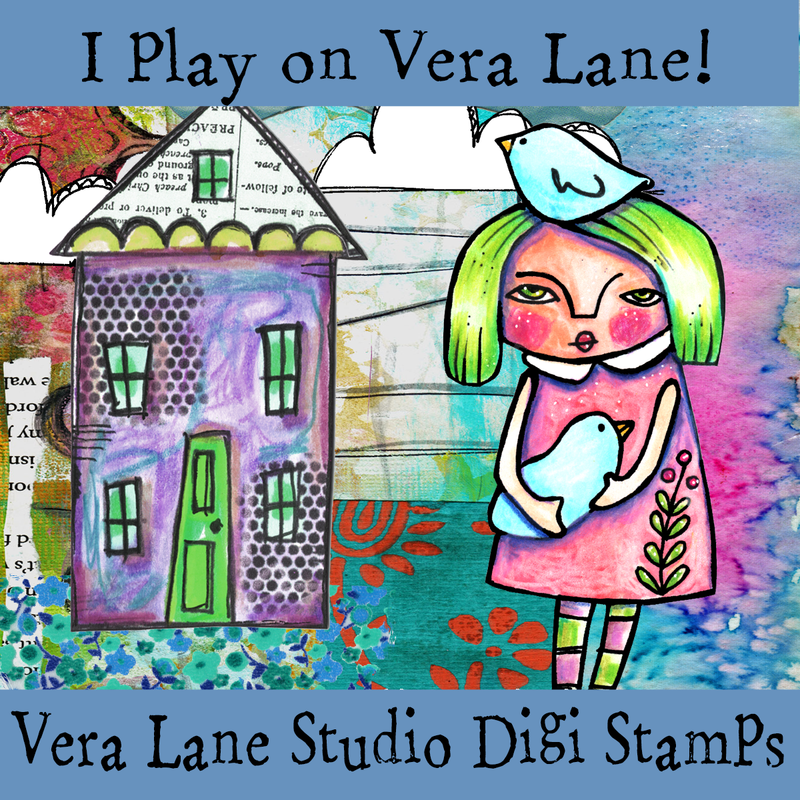 Children love stamping and also enjoy what is created especially for them. 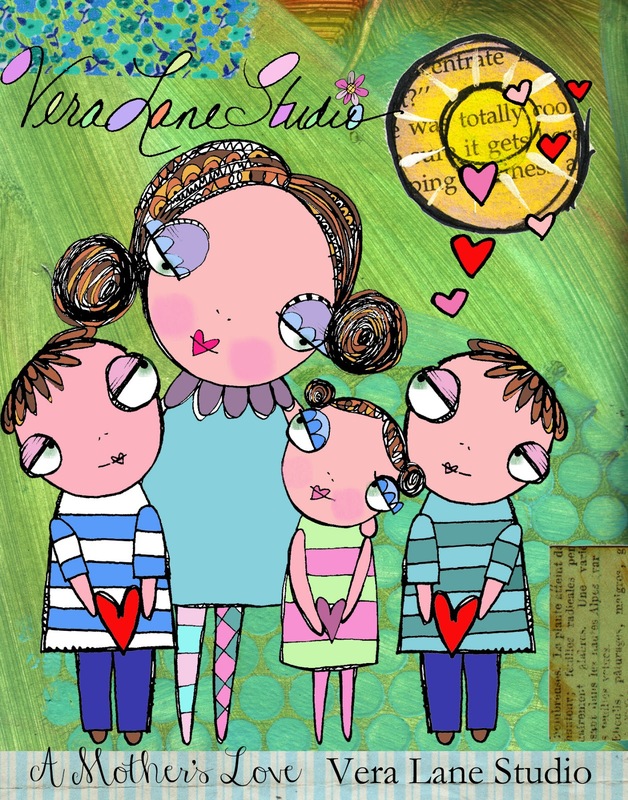 For this week’s Stampotique Designers Challenge I am challenging you to create a card that will have appeal for a child, be it a young one or teen. 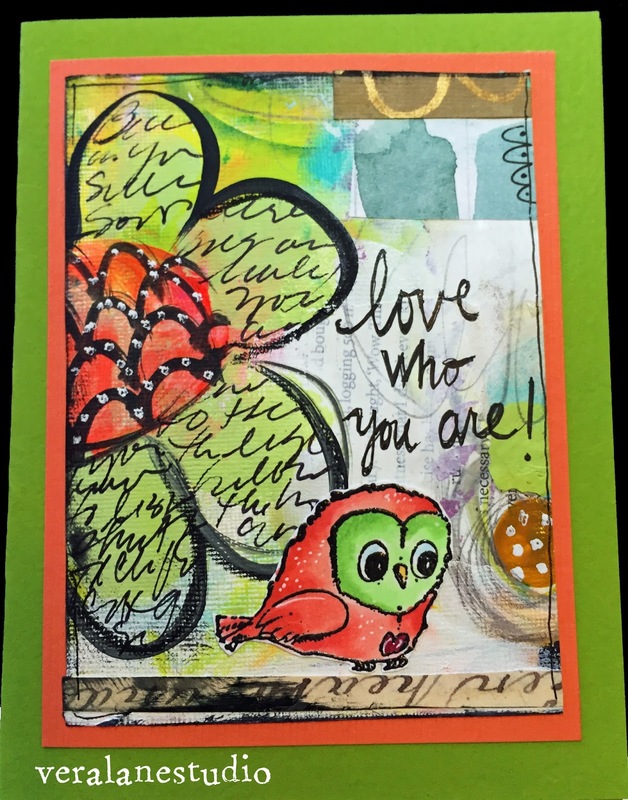 I created a card to accompany a travel art kit for a young student of mine. She will be taking a long flight next week and I wanted to make sure she could stay busy creating during the flight! 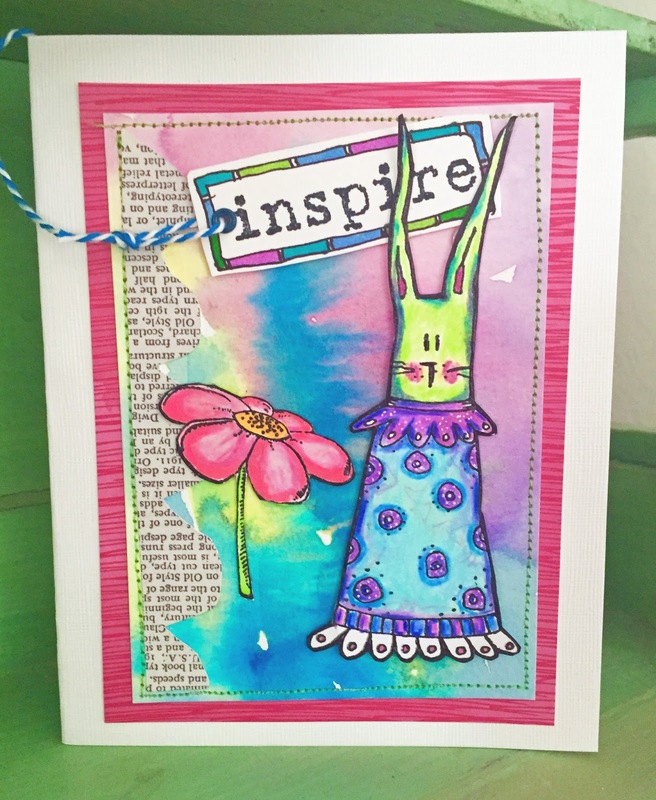 This card "inspire" will accompany her gift. 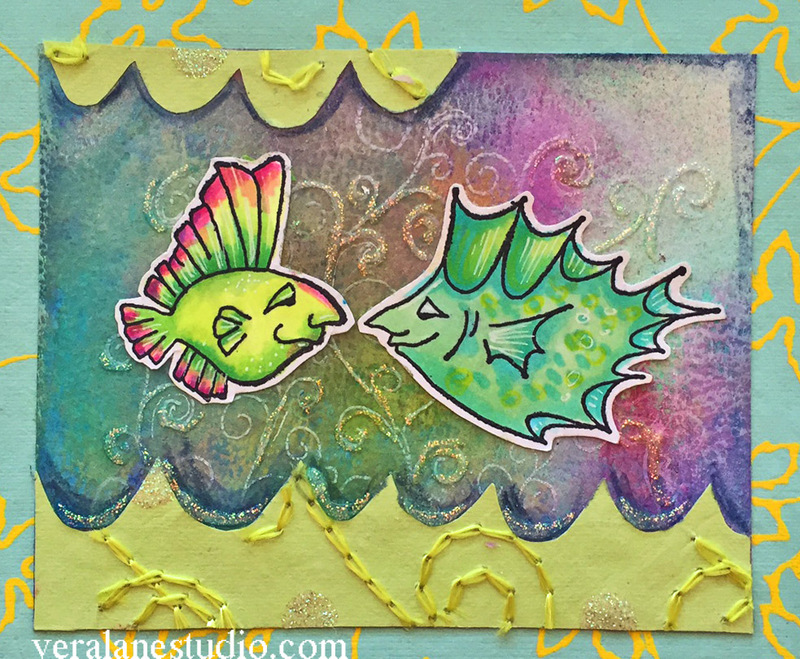 I began by bleeding watercolors together to create a background. 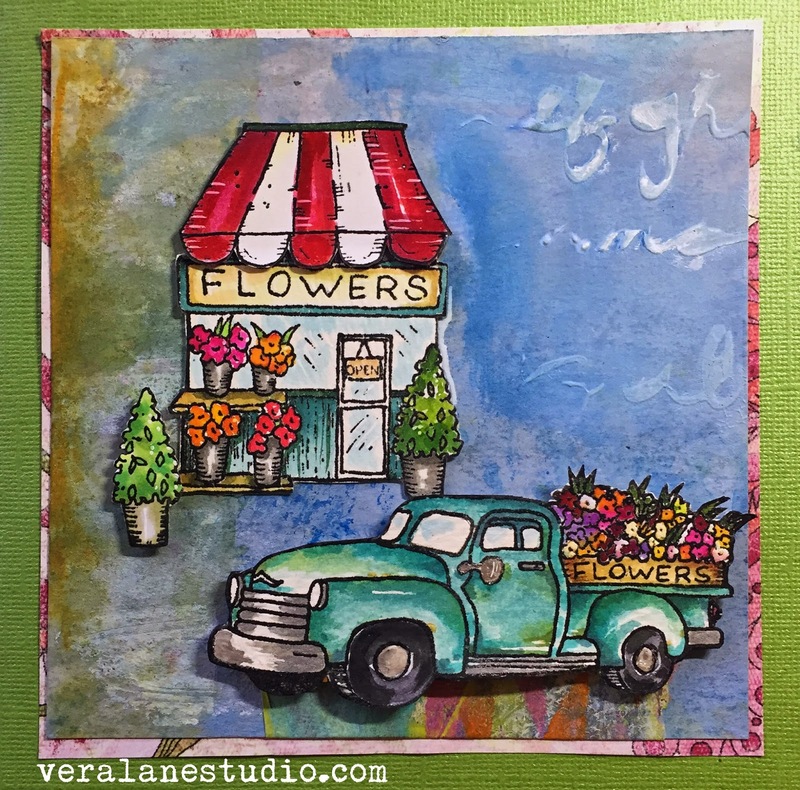 This is a technique she had completed in a recent watercolor lesson. I let the wet on wet colors bleed into each other. 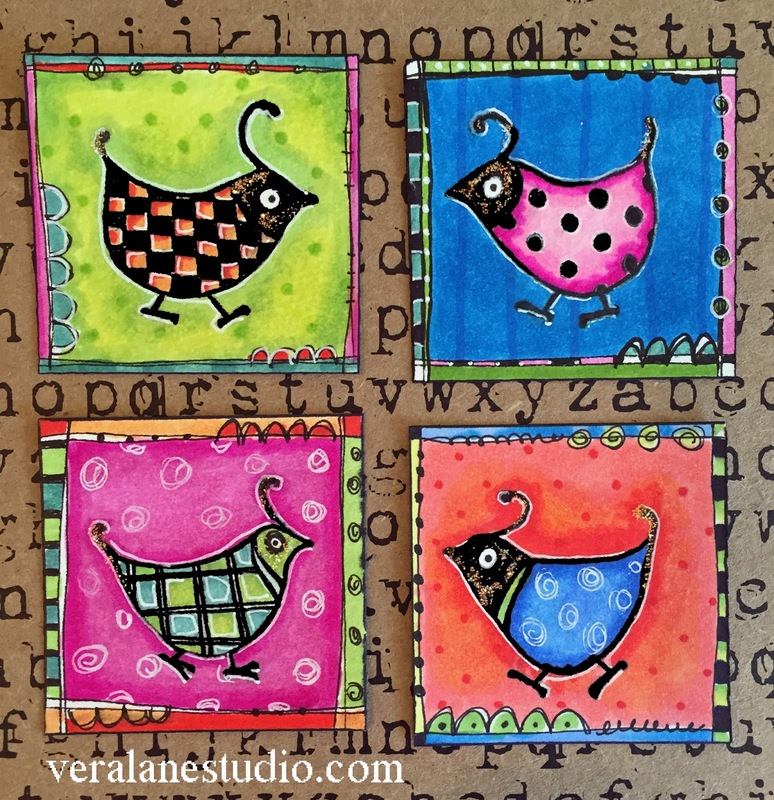 The stamps are colored with markers and Prismacolor pencils. I had another Kate Crane image colored and selected for this card but my dog ran off with it. Since Frock was also colored I made the substitution. 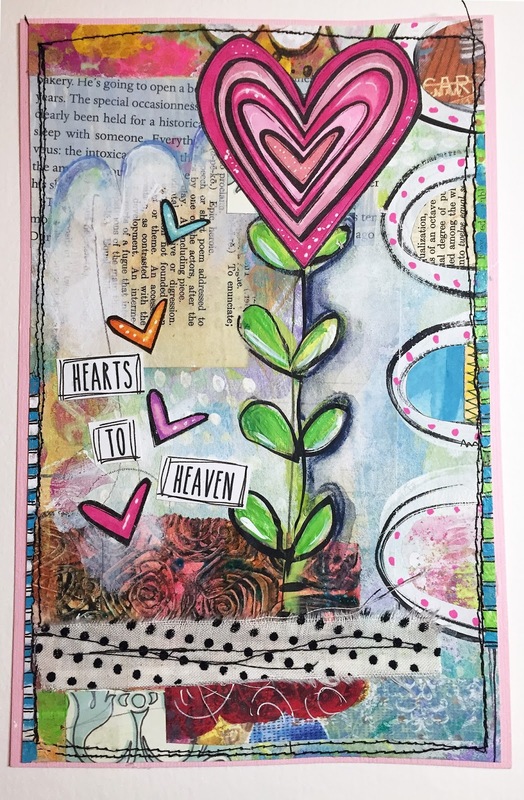 The other two stamps in this creation are inspire and the flower from Agatha's Flower. It's a simple card with bright cheerful colors and happy images. I hope she likes it. Carol is challenging us to create an early Halloween inspiration. 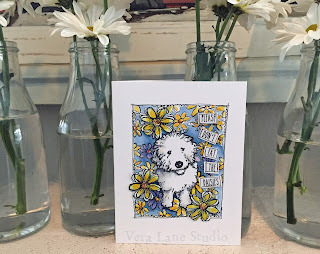 This simple card has giving me fits -- I have been coloring and fussy cutting all week which has resulted in major migraine and neck aches. So I advise taking needed breaks!!! My original card ripped when I pulled fibers around the edge. I hastily turned it into a tag -- which I was most unhappy with. So with a new attitude and a little effort I returned it to the card it was meant to be, and perhaps this paper back is even a better choice! 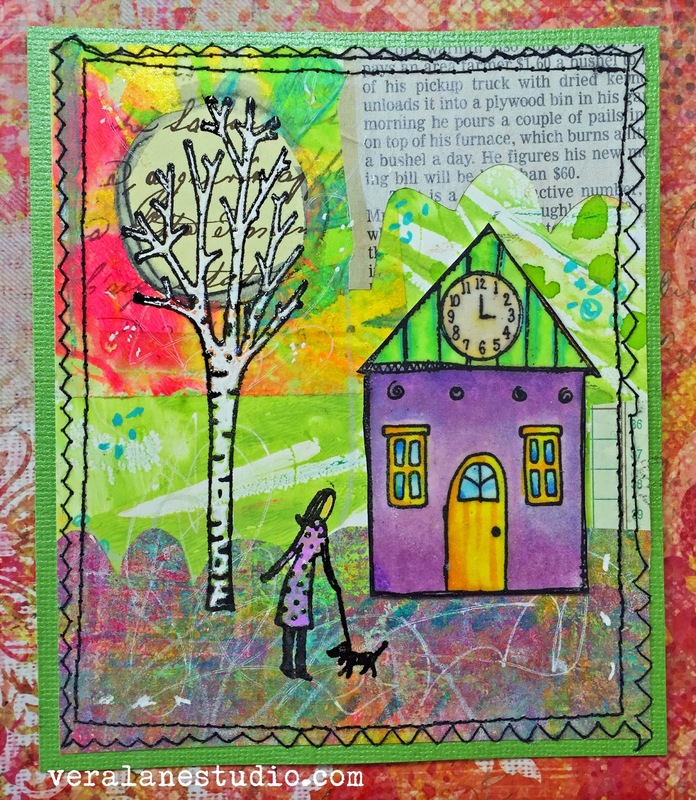 The house is one of five in my stitched houses stamp. My Skullboy is standing behind a portion of Daniel's Picket Fence. The background was from an exercise I was doing with students, creating dry brush stripes in analogous colors. The house is colored with Copics and Skullboy is a combination of Copic marker and Prismacolor. Nellie is our hostess this week challenging us to use just two stamps. 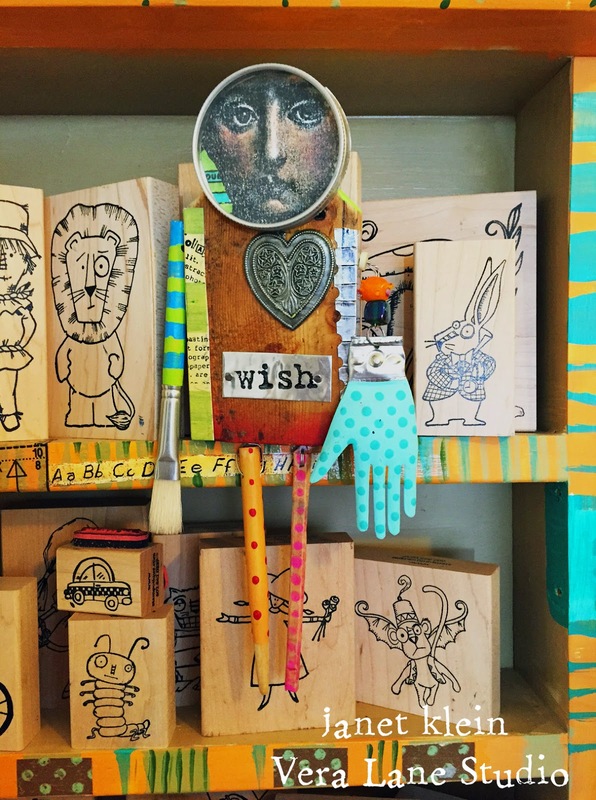 Nellie says she likes to use lots of stamps in her creations. I tend to use one or two and add collage elements. 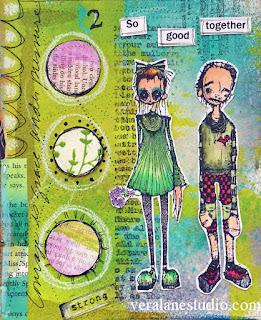 We all have unique ways of working with these stamps which makes it all the more fun to join in on these designer challenges. Even though Toto belongs to Dorothy in the land of OZ I though he'd look awfully cute along side of Nina. I love finding random sentences in books to work into my cards and this copy, "I don't know what will happen" seems to fit perfectly with Toto's expression. My background is stenciled and stitched to cardstock. 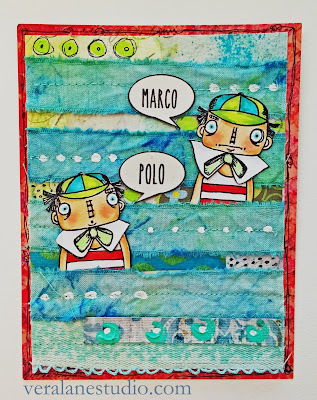 Scrap cut into a scallop border and washi tape adds to the composition. "Just for you" was typed on the computer and printed. I'm hostess this week for the SDC197 challenge. I am challenging you to use some form of tin in your artwork. 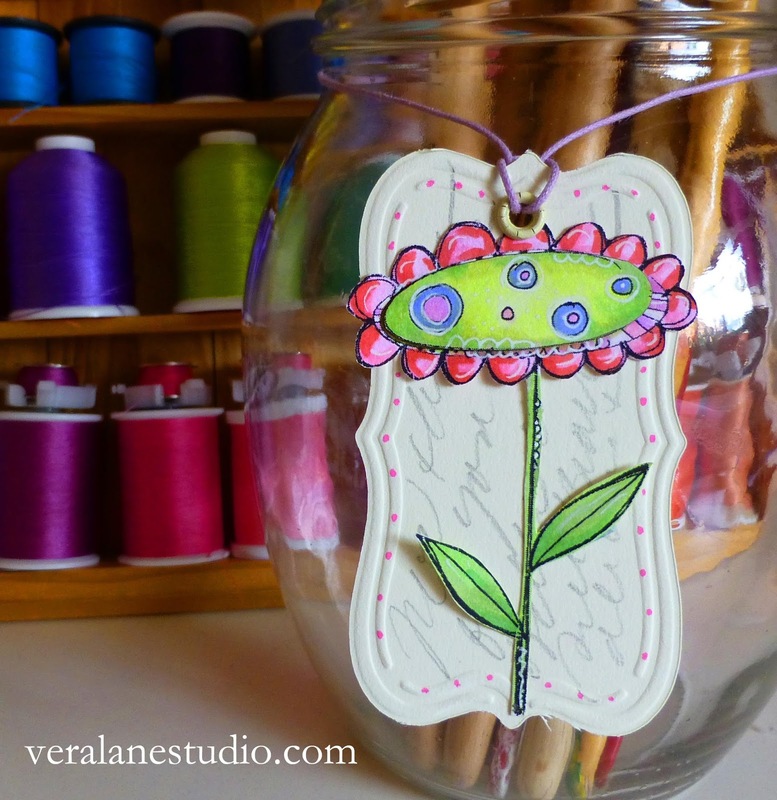 Consider incorporating craft tin, tin tape, an Altoid container, a repurposed tin can or any tin object to incorporate with your stamping. 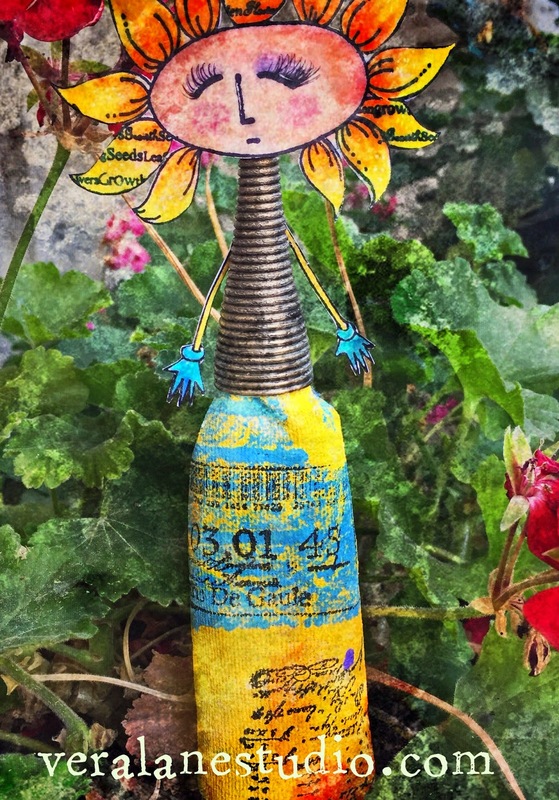 My entry for this tin challenge is an assemblage art doll that I created for a friend. I've included a variety of tin objects and three Stampotique stamps. I began with a block of wood. I cut a paint brush and a couple of chopsticks for limps and painted them accordingly with acrylics. 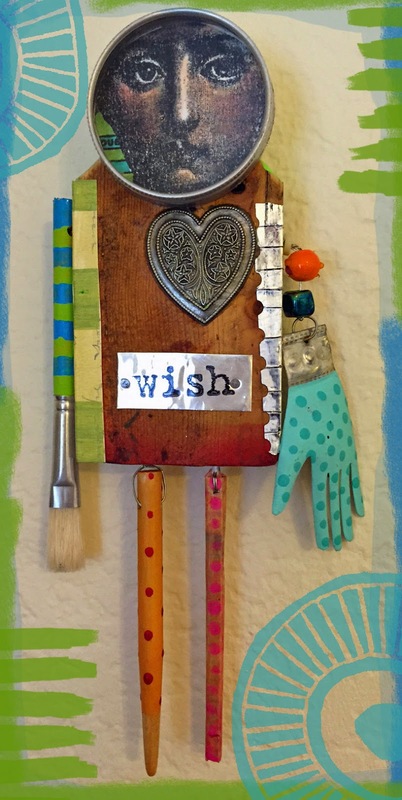 I added beads and a hand painted tin hand from Oaxaca Mexico. I applied metal tape to one side of the doll that is buffed with Stazon ink. dolls with my fifth grade students. 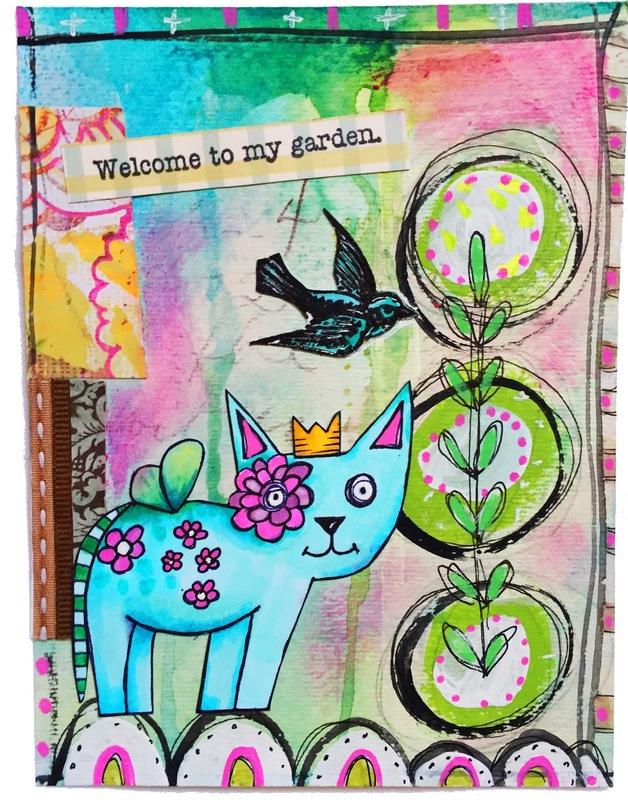 It was fun to revisit this project with the addition of Stampotique stamps. I hope your enjoy my tinny challenge! 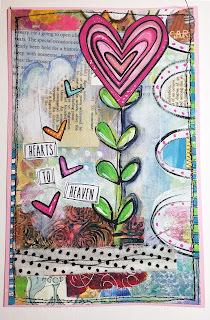 Corrie is hostess this week at the Stampotique Designer's Challenge and her request is to use stencils. There are so many fun ones out on the market and I have also enjoyed making my own. 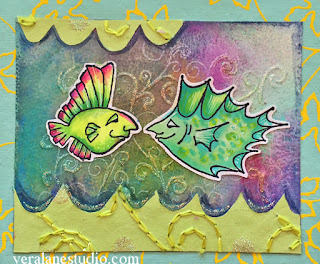 In this sample I used Crafter's Workshop mini tile stencil and the edge from Dyan Reaveley's Dylusions Stencil, Number Jumble with acrylic paints on my Gelli Plate® printed onto deli paper. 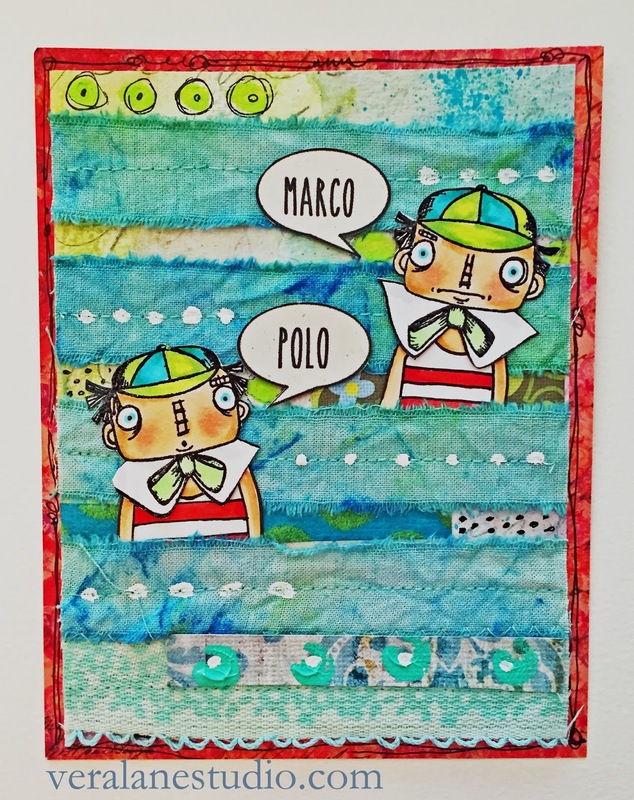 I cropped the deli paper and stitched it in place for my background on white cardstock. 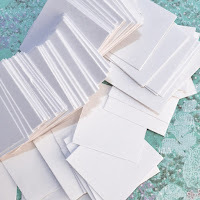 I stamped my 2 nuage image and Roc's scalloped lace border on scrapbook paper. 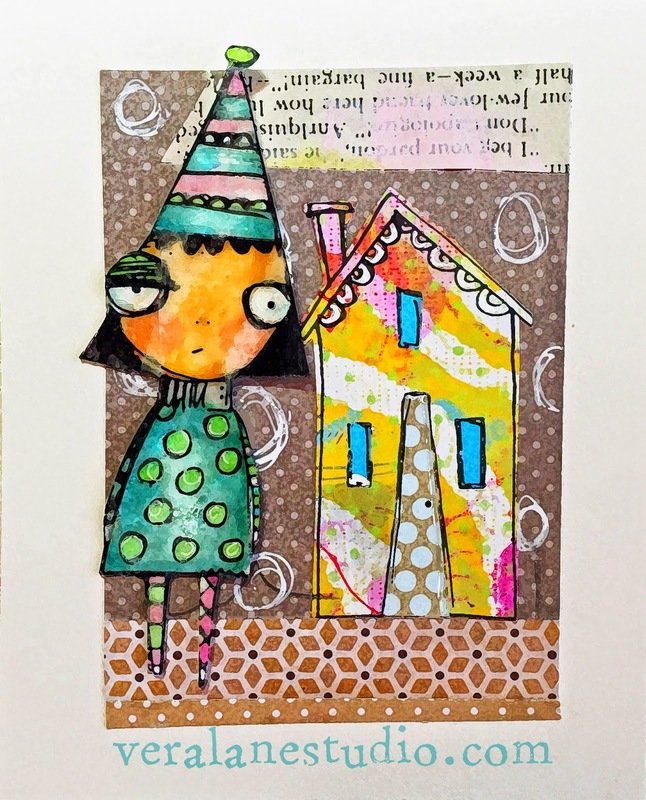 One house of my stitched houses is stamped and colored with Copics. Midge is stamped on paint spattered paper. Images are mounted with silicone dots. I used Posca and PITT pens to handwrite "hello." 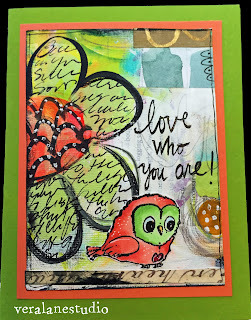 Grab your stencils and join us this week. Looking forward to seeing your submissions. Our designer hostess this week is Kaz. Brrrrrr... she says, living in the UK. She has requested we being a little Stampotique sunshine to her with a "Bring me sunshine" theme. So lets sunny up her days and also get a chance to win some lovely Stampotique stamps! 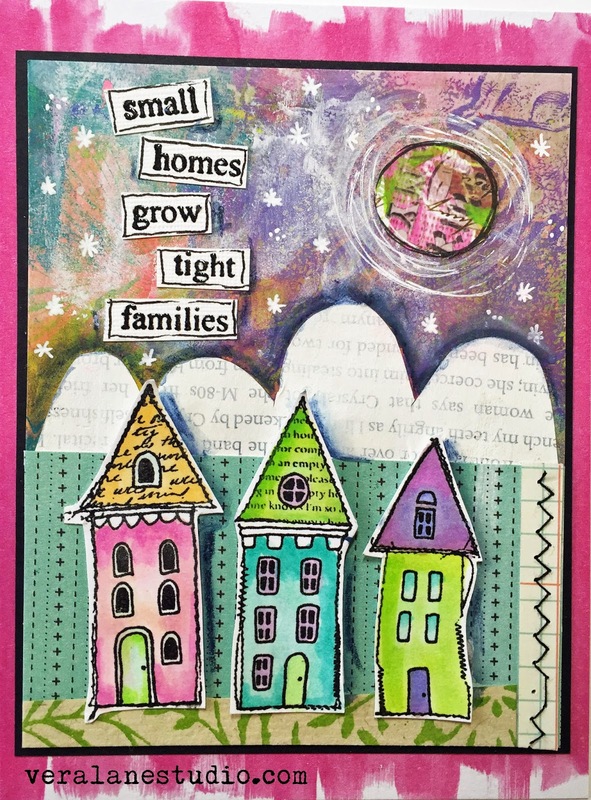 This theme makes me think of my friends and family in NYC. It's been cold and they have been hit hard with snow. So I used my NYNY! 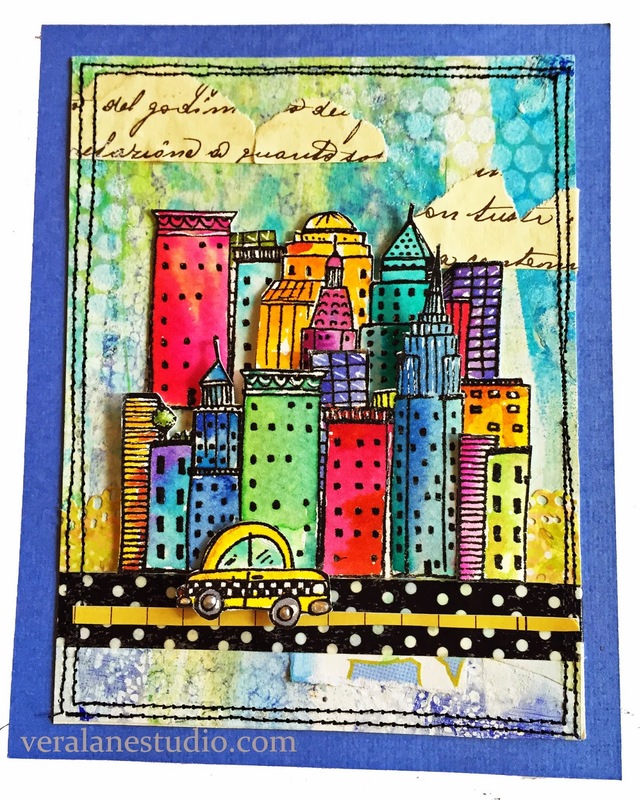 stamp and little taxi to create a bright and sunny NYC. The city stamp was repeated and trimmed to create a 3-D layered city. 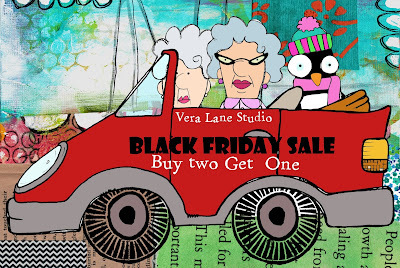 I stamped with Versafine onyx black and embossed. Peerless watercolors and a waterbrush were used to color the images. 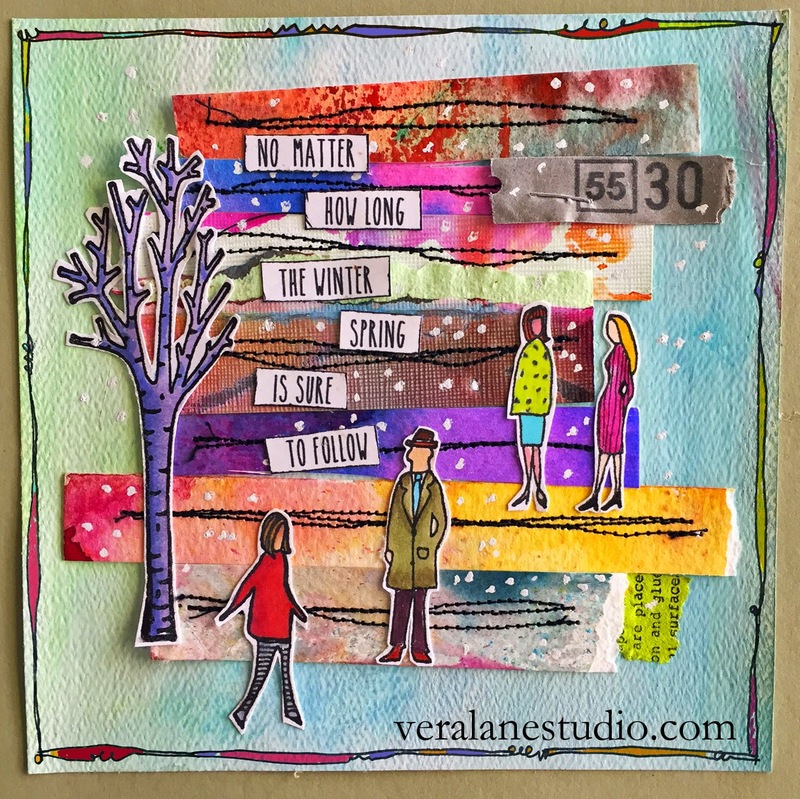 My background is layers of paint and collage scraps. A piece of washi tape creates a street for the taxi to drive on. 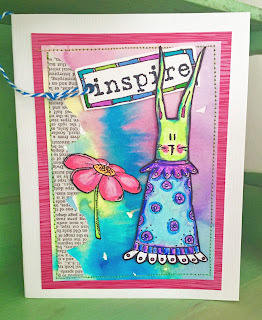 Stampotique 2015 New Image Blog Hop! 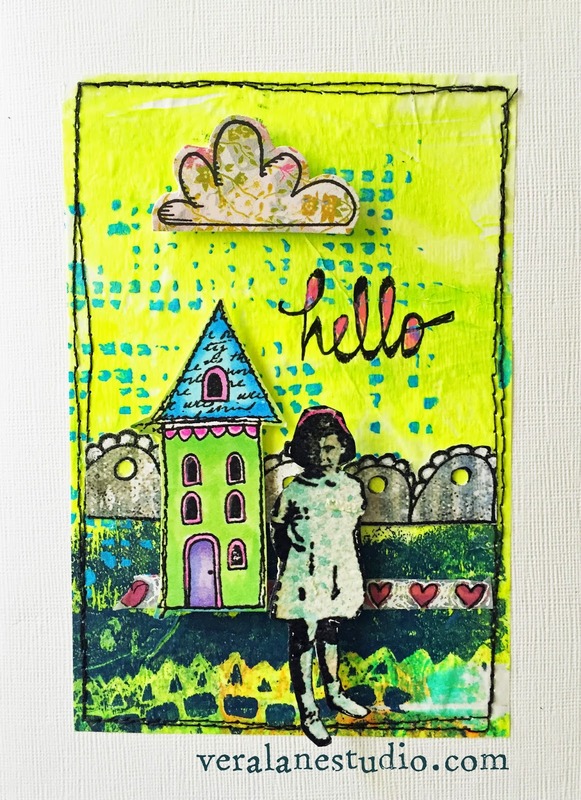 You should have arrived here from the Stampotique Designer's Challenge blog. Your next stop along the way will be Coby vanWilligenburg. If you get lost anywhere along the way you can come back to the Stampotique Designer's Challenge blog to find your way.